Up until recently, I was the only one at Viget HQ to regularly use a pen tablet. So naturally it's a bit of a curiosity around here. And before I got mine I was very curious, but worried about buying a relatively expensive accessory like a pen tablet without knowing what they're really like to work with. There are a ton of reviews and information out there on the internet about pen tablets, but I thought I'd talk my personal experience with using a tablet, what's surprised me when I first started using mine, and why it's ultimately an awesome tool for designers. So just what is a pen tablet? An input device that works similar to pencil and paper, by drawing with a "pen" stylus on a tablet (or sometimes even directly onto a monitor, if you want to invest in the really expensive tablets). Takes up more real estate than a mouse pad. Depending on what size you get. There are some smaller tablets that are about the same size as a mouse pad. But the best-handling tablets seem to be, like the chairs in Goldilocks, not too small, but not too big. I have a medium-sized, widescreen Intuos; it takes up 16x11 inches of space on my desk. 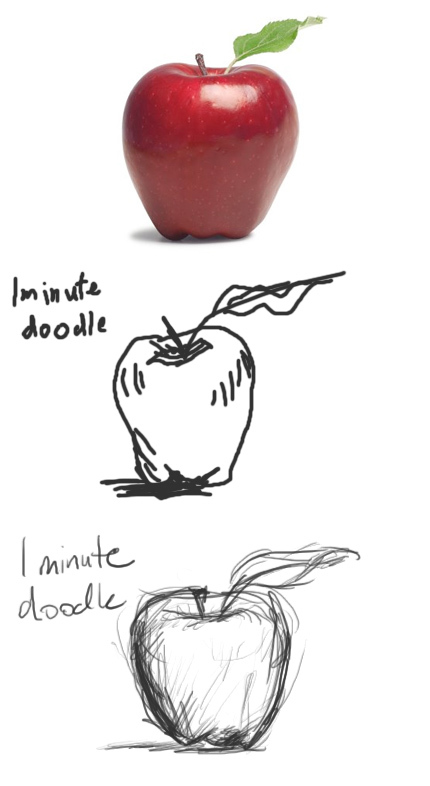 The first time you use it, you won't draw as well as you do with a mouse. This is shocking and upsetting, since you just spent all this money buying it. But after years of drawing and working with a mouse, it takes some time to adjust. But with practice, within a couple days you'll have the gist of it. Absolute positioning, hovering, and clicking take getting used to. Absolute positioning is the default way the tablet works, but it can be turned off. But once you get used to it, you'll never look back. With absolute positioning, when you touch the top left corner of the tablet, the cursor goes to the top left corner of the screen. Pick up the pen, move it to the bottom right corner of the tablet, the cursor immediately goes to the bottom right corner of the screen. This is amazing after years of dragging a mouse, picking it up and moving down after getting to the top of the pad, then dragging it some more to get the cursor to the top of the screen. It also feels really unnatural for the first few days. Hovering the pen feels weird too. To move the cursor around, you don't actually touch the tablet, only hover the pen tip right above the tablet. You only touch the tablet to click or drag. At first it's hard to gauge how high you're holding the pen, how close you are to clicking, etc. These are all aspects of handling a pen tablet that feel strange for a week or so, then become second nature. Pick the pen up, put it down, repeat x1000. When you use let go of a mouse to type on the keyboard, the mouse stays exactly where you left it, ready to resume when you are. This is one aspect of a tablet that nobody mentioned when I was researching tablets, but it's immediately one of the most distracting things. When you go to type, you have to either juggle the pen in your hand, or put it down and take the time to pick it back up. I handle this by putting the pen straight up in the "inkwell" stand that comes with the tablet, and keeping the inkwell right between my keyboard and tablet. My right hand goes by it and drops off the pen on the way to the keyboard, and on the way back to the tablet I pick the pen back up with minimal fuss, since it's already upright and ready to be used. The quickest way to conquer the curve: stop using the mouse entirely. Stop using the mouse completely! It's great! To get used to using the pen, I swore off of using a mouse for anything for a couple weeks. A couple weeks have turned into over a year and a half. On the downside, a mouse now feels awkward and jerky in my hand; but that is far outweighed by the fact that I have no more wrist pain. Holding the pen is a more natural position than handling a mouse, so I no longer have flare-ups of mouse-induced wrist soreness. Using a pen tablet is a very different experience than using a mouse, and drastically alters your workflow. For the first couple weeks it'll feel awkward and cumbersome. But if you stick with it, with a little practice, it's completely worth it. Working on the computer all day is more natural and comfortable. And working in Photoshop is even better; with a pen I can work on files quicker, easier, and with inifintely better results. Do you have a pen tablet? Are you similarly as dependant on it? Or is it collecting dust in a drawer somewhere?